- Red Rubber Shielded ABEC-5 Bearings - Fast! 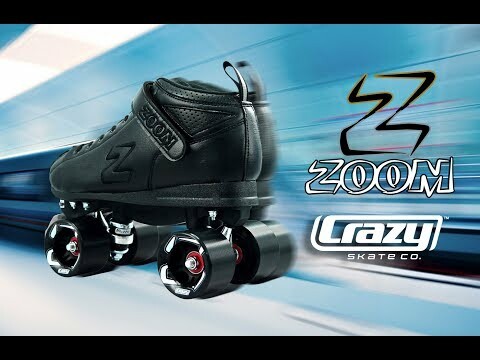 The ZOOM by Crazy Skates brings sleek lines to it’s new high performance speed skate offering. Built with a wide fitting padded boot that offers plenty of toe room - this speed style boot offers comfort and performance with effortless style, at a low cost. Underneath the boot, the ZOOM brings the tech with an integrated allen key adjustable toe stop featured on the new GALAXY composite plate, metal trucks and reverse kingpins all come standard. The skate package also includes a set of newly designed, non marking BOOST toe stops, which give a lively rebound when spinning, jumping and running on toe stops. The ZOOM also features a brand new signature wheel - also named Zoom. The Zoom wheel feautres an oversized custom hub with super low profile ‘race quality’ urethane, this super lightweight wheel gives great acceleration, top speed and an ultra-stiff response. Packed with ABEC 5 Red rubber shielded bearings - this skate is built to perform at the highest level.